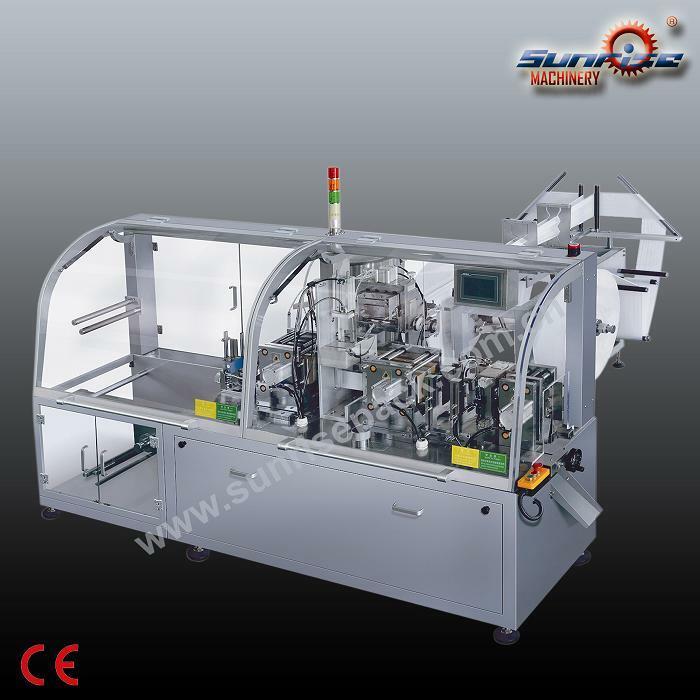 The whole machine adopts integration design of light, electricity and gas, is currently the most advanced one of the paper, non-woven packaging equipment. It is suitable or Four-side sealing of wet wipes, alcohol swab and pad, disinfect cloth, etc. The machine is suitable to be used in the field of restaurant, medicine and hygiene, such as medicine plaster, disinfectants cotton paper, disinfectant napkin, toilet tissue and fragrant tissue etc. 1. It adopts light, electricity and air power to control the machine. Itwarns up when it meets trouble. Safety control instruction. 2. It can setsingle bag or two bags in row. 3. It can add multi-kinds of liquid, add per liquid into per bag or add all the liquid in the same bag.The liquid is added exactly by metering pump imported from Japan. 4.It is controlled by touch screen PLC controller.lt can be set freely,and it is easy to operate. less rejection. lt is easy to clean the machine and the appearance is beautiful.